CHELSEA space presents a new work by Oswaldo Maciá, taking the form of an olfactory–acoustic sculptural composition. The Library of Cynicism takes the ancient Greek figure of Diogenes as a starting point to undo assumptions of truth and belief through a sound and smell experiment with objects. Through his sound-sculptures, smell-sculptures, videos and installations Maciá creates encounters that initiate and reflect upon multiple relationships with what we believe and understand to be truth and reality. His practice sets out to complicate what we think we know by offering counter-perceptions. These are proposals to look harder, listen more acutely and pay attention to all of our senses in order that we might think deeper about the structures of knowledge we rely on to construct knowledge. 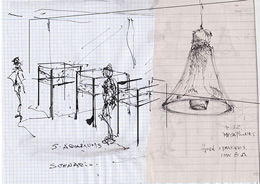 Oswaldo Maciá has exhibited internationally, taking part in group exhibitions and biennales, including Casa Daros, Rio de Janiero, Fluxus, Atlanta, Manifesta 9, Belgium, ICA Soundworks in Bruce Nauman’s Days, London, 8a Bienal do Mercosul, Brazil, XI Bienal de Cuenca, Ecuador, XVIII, Espaivisor, Valencia, Spain, Haunch of Venison, Whitechapel Art Gallery, Alison Jacques Gallery, London and Marian Goodman Gallery, Paris. Maciá has work in collections including Tate and Daros Collection. As with each exhibition at CHELSEA space, a new illustrated publication will accompany the show.